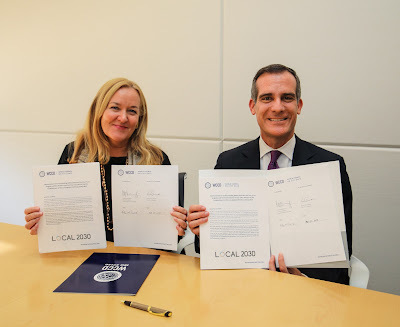 Today in Los Angeles, Mayor Eric Garcetti and Dr. Patricia McCarney, President and CEO of the World Council on City Data (WCCD) – located in Toronto, Canada - signed an MOU towards the establishment of the LA-WCCD Local Data Hub. “As a WCCD Foundation City, Los Angeles is part of a network of global cities committed to comparative high caliber city data. Los Angeles is a natural partner in helping to drive forward our shared agenda of harnessing standardized data to drive smarter, more sustainable, resilient, prosperous and inclusive cities. Locating one of the eight WCCD Local Data Hubs in Los Angeles City Hall, together with other leading cities from Dubai to Toronto to Buenos Aires, will help to drive forward progress on this key set of commitments,” stated Dr. McCarney. In addition to Mayor Garcetti, global city leaders such as Mayor John Tory of Toronto, the Secretary General of the Executive Council of Dubai, H.E. Abdulla Mohammed Al Basti and Mayor Horacio Rodríguez Larreta of Buenos Aires have stepped up to launch WCCD Local Data Hubs. Beyond highlighting the importance of data-driven decision making at the city level, as well as the importance of global comparability as cities rise in importance internationally, Mayor Garcetti underlined his commitment to driving positive change at the city level while simultaneously driving global progress against the SDGs: “Los Angeles can, should, and will lead in building the healthier and more prosperous world that we dream of for our children and grandchildren,” said Mayor Garcetti. First certified in 2014, Los Angeles has achieved WCCD ISO 37120 Platinum Certification every year since joining the WCCD global network of cities. The WCCD has led the development of ISO 37120, the first international standard ever published for city level data. The LA-WCCD Local Data Hub will work towards building high calibre city data to drive progress on key local, national and global agendas. In addition to demonstrating LA’s commitment to data-driven decision making and sustainability, one initial priority of the LA-WCCD Local Data Hub will be to support the United Nations sustainability agenda by catalysing city-level tracking of progress towards the 2030 Agenda for Sustainable Development. The LA-WCCD Local Data Hub will leverage the set of 100 city indicators within WCCD’s ISO 37120 standard, which have been mapped across all 17 themes of the Sustainable Development Goals (SDGs), in a major report launched at United Nations Headquarters in July 2017 at a session hosted by the Office of the UN Secretary General on localizing the SDGs. Alongside the WCCD, Los Angeles is embracing the Sustainable Development Goals (SDGs) and is committed to serving as an example throughout California, the United States and globally.